watercolour on 300 lb. Arches paper. This is my friend, Lee Ann, with her daughter, Katy, whose grandmother, Phyllis, is a close friend of mine. The reference photograph was unposed, as you can see. The new mom, very tired from night feedings, is fast asleep, baby Katie cuddled beside her. The similar posture in each is what inspired me to paint this watercolour. 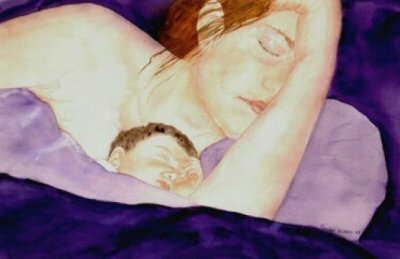 Simon and Garfunkle would perhaps have liked this one, from "Mother and Child Reunion".